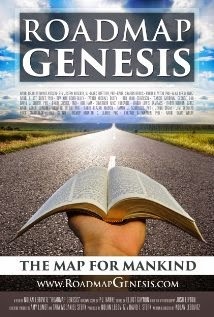 This week, my family had the opportunity to view an online screening of a new documentary, Roadmap Genesis. We really had no idea what to expect. I was a bit distracted when this review opportunity came up, to be quite honest. Usually I read the description to my family and they vote on whether we should go for it. This time, I just said "yes" without talking to them at all. Which meant I really didn't read this description either. We did enjoy the documentary. The action bounced around a lot, and no one segment was overly long. There were man on the street interviews, input from nearly 30 experts (going by the list in the end credits), movie clips, clips from talk shows and comedians, and so much more. The experts cover a whole lot of ground within the Judeo-Christian community. Many branches of Christianity were covered as well as Judaism. The basic theme was that 'Society faces so many problems, and Genesis addresses them all.' This hits on some tough issues -- racism, environmental problems, hunger -- but it does it in a way that isn't too harsh for my kids, anyway (ages 8 to 17). I have a DVD to give away!